Acting as the caregiver for an elderly friend or family member means taking on a large number of new responsibilities. One such responsibility is helping to ensure that he or she receives adequate dental care. 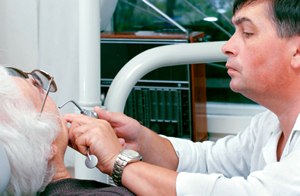 There are a few things you should keep in mind when helping maintain the dental health of an elderly friend or family member. Depending on the condition of your elderly loved one, he or she may not be able to tell you when his or her tooth hurts, or when something feels off. As such, you should pay close attention to the state of his or her teeth, regularly inspecting them to see if there are any developing issues. Some things to look for are excessive wear, cracks, and chips. In addition, if you notice that a tooth begins to wiggle in its socket, you should have him or her looked at right away. Please call our office, and let us know the situation, and we will clear an appointment for him or her as soon as we can. You have brushed your own teeth all of your life, so you have become accustomed to the necessary motions in relation to your own set of teeth. However, as you will soon find out, brushing someone else's teeth is a skill that must be learned and practiced. You will employ a different set of motions, and so you must make sure that you practice in order to deliver the necessary care to your elderly friend or family member. Finally, because you cannot feel the pressure in someone else's mouth, be sure that you take care when you are flossing the teeth of an elderly person. Doing so will help you avoid inadvertently injuring him or her.